Welcome to Day 10 of our July Kit previews! 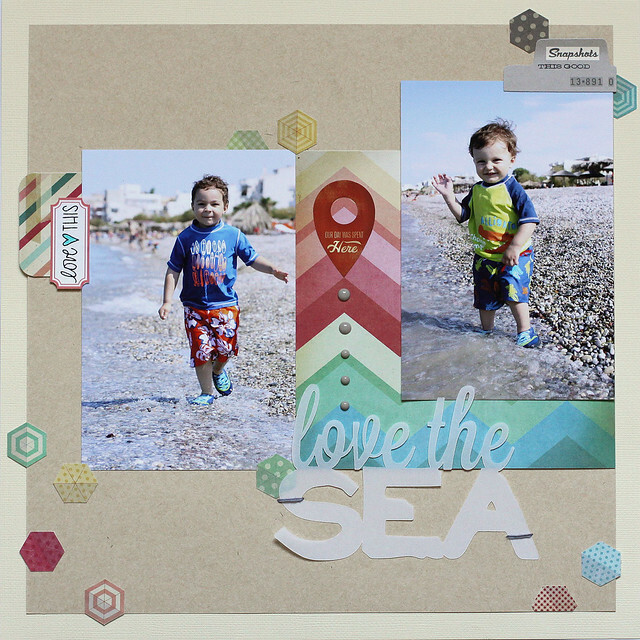 Today I am sharing a layout with a focus on the 6x6 paper pad included in the PL kit, as well as some bits from the Travel Add-On and Stamp Add-on. 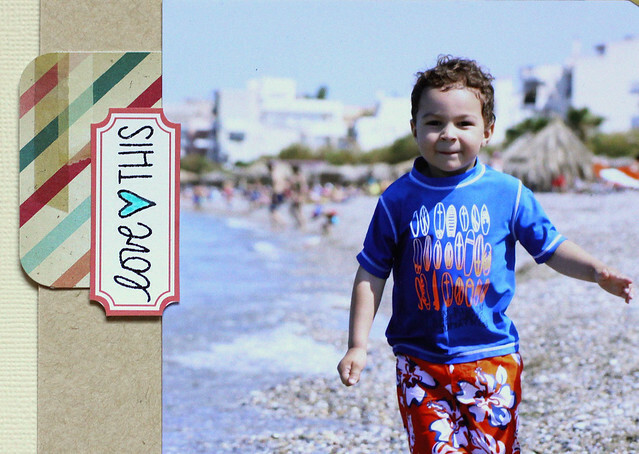 My family and I just returned home from an incredible vacation to Greece and, with the inspiring travel theme throughout this month's kits, I naturally wanted to get started scrapping my favorite memories right away! The photos I chose here are my very favorite beach shots of each of our children. I'm still learning to use my camera in manual mode and was very proud of how they turned out. That being said, my goal was to keep this layout fairly simple and allow the photos to shine. My base for this layout was clear from the start - I HAD to use the rainbow chevron pattern you see here between the pictures. Isn't it gorgeous? The title was cut from vellum using my Silhouette and accented with hexagon bits, cut from another pattern in the pad. I stitched the title to my layout using the twine that wrapped around the Travel Add-On kit this month. Another of my favorite papers in this kit was this diagonal stripe with the tape detail so, I cut a small bit, rounded the corners and used it as a tab and base for a label. The "love this" is my new favorite stamp. Ever. Just added a pop of color to the heart with a Prismacolor pencil. To highlight that pretty chevron a bit more and unify the photos, I used the geotag sticker I had held over form the June PL kit and added a trail of enamel dots, from July's Travel Add-on, leading to the title. 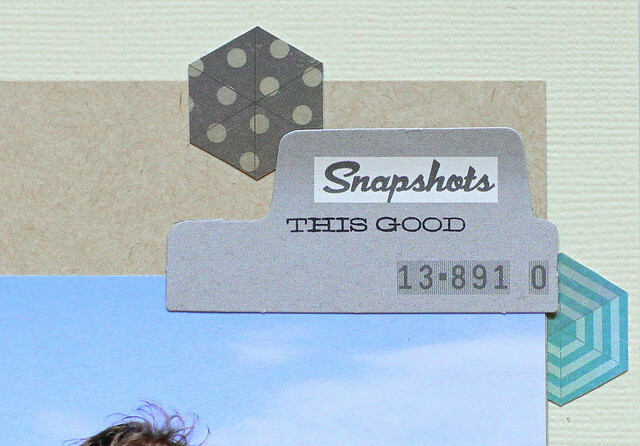 Add in a few more scattered hand-cut hexagons around the page, the sweet "Snapshots" tab paired with one of the Stamps from the Add-on and I called it done! Don't forget to leave a comment with a guess of what is in this month's kits for your chance to win a $5 GC to the CTK store! beautiful pictures ... and layout! I think the chevron paper is from CP the Pier. Love the simple design of your layout Jen! Beautiful!! The design is striking and your pictures are adorable! Great great page Jen! 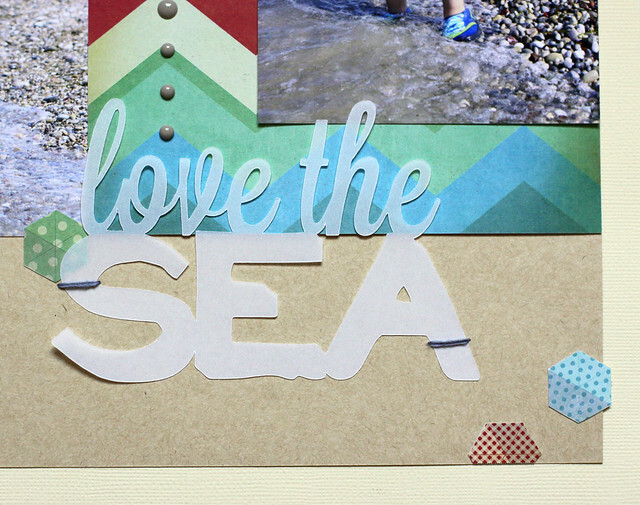 I love how you used that chevron paper. The design seems overwhelming but when you break it down like this, it's awesome! That paper is Crate Paper The Pier. The pier by crate paper! I always love your photographs, Jen! Beautiful photos and beautiful layout! 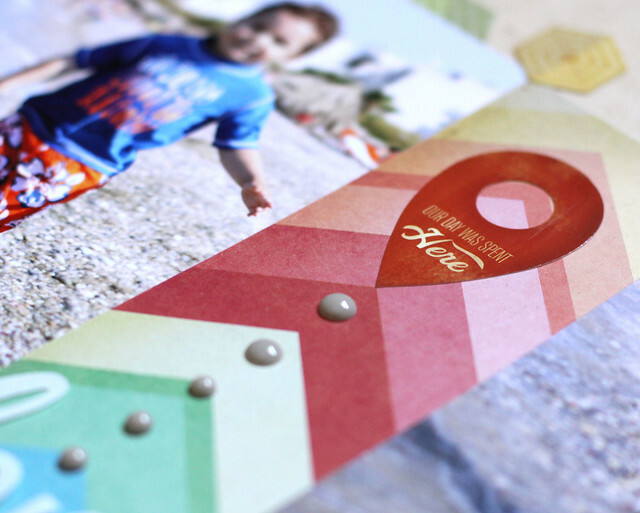 love your kids photo and love how you cute the hexagons out! Ooh that tab is from OA Travel Girl. Maybe the Tid Bits pack? Love that title diecut! !